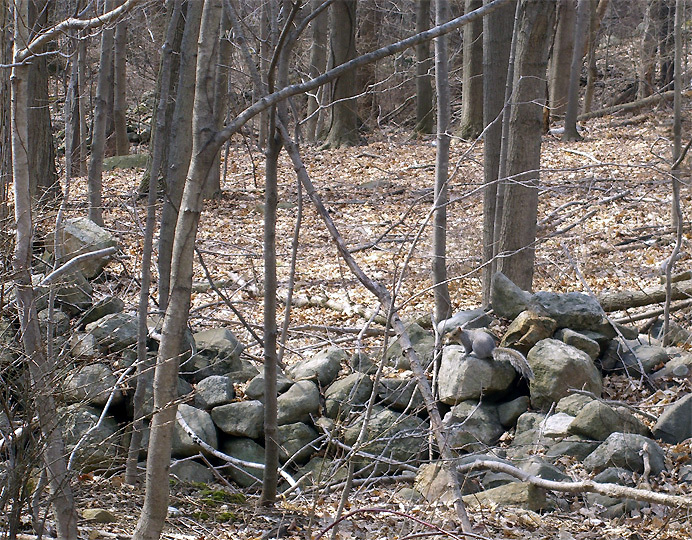 Can you find the animal in these woods I photographed on King Street? if you do. I think this is an appropriate picture for Tax Day, because, like animals in the woods, tax deductions are easy to overlook. For example, did you remember to deduct as a medical expense what you paid for DietPower? You can do so as long as you are using our program against a health condition identified by your physician. Details. One reason animals are so good at camouflage is that their coats have evolved to cancel the shading caused by overhead lighting. That's why their backs are darker than their bellies. In fact, this reverse shading is so precise that it even takes into account the curvature of their sides. "Obliterative shading," as zoologists call it, makes the animal appear flat against the background, instead of three-dimensional. Obliterative shading and other visual marvels are amply illustrated in a classic monograph, Adaptive Coloration in Animals, originally published in 1940 by Hugh B. Cott, a British zoologist whose work strongly influenced the development of camouflage in World War II. I still remember what a wonder it was to read this book in my youth. It is now out of print, but I see a few copies for sale on Amazon. No, the animal in this picture is not a skunk. If it were, you'd have seen it by now. Keep looking.